The staff was great. They were very friendly and answered any questions we had quickly. Great, Comfortable Condo in a beautiful location! It's so easy to call At The Beach Rentals. We're in their system so making a reservation is quick and easy. They have always listened to us and taken care of us. 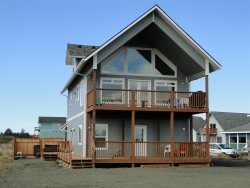 We like staying at the Nautilus because it is a quiet location but still close to the main Ocean Shores shops - a quick easy walk or drive. It has always been clean and we know what to expect when we arrive. Ocean views from 2nd and 3rd floor condos, a nice grassy area and not too far to the beach, and we can bring our dog, if we wish. Very quick responses to questions. Easy check in and out. Comfy and cozy. Great ocean view. Everything provided as advertised. Thank you for a great stay; see you next year!